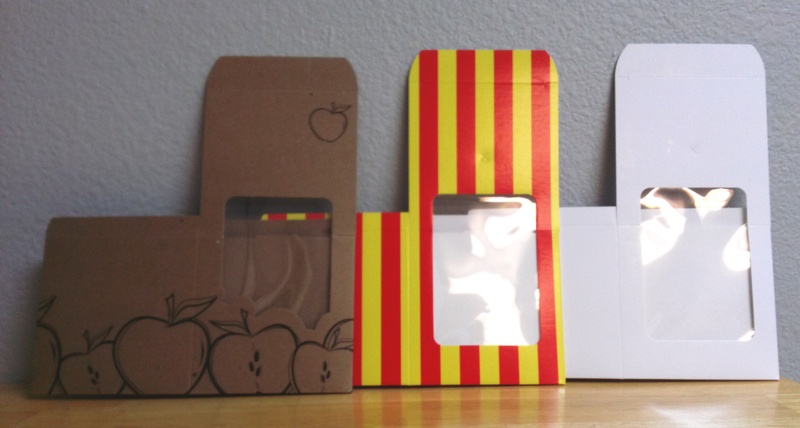 At Daffy Farms, we’re always on the lookout for fun new ways to package caramel apples and a little while ago, we found these adorable caramel apple boxes at Box & Wrap! They come in three different patterns and range in price from about $0.60 to $1.20 depending on which design and the quantity ordered. They arrive flat. 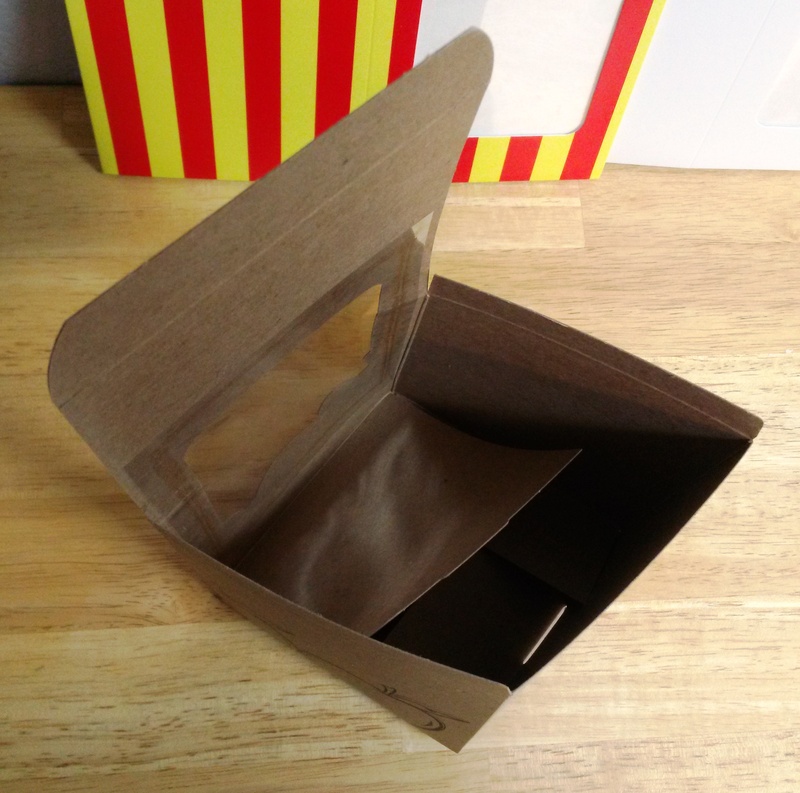 And are incredibly easy to fold, as they are already glued in the right places. 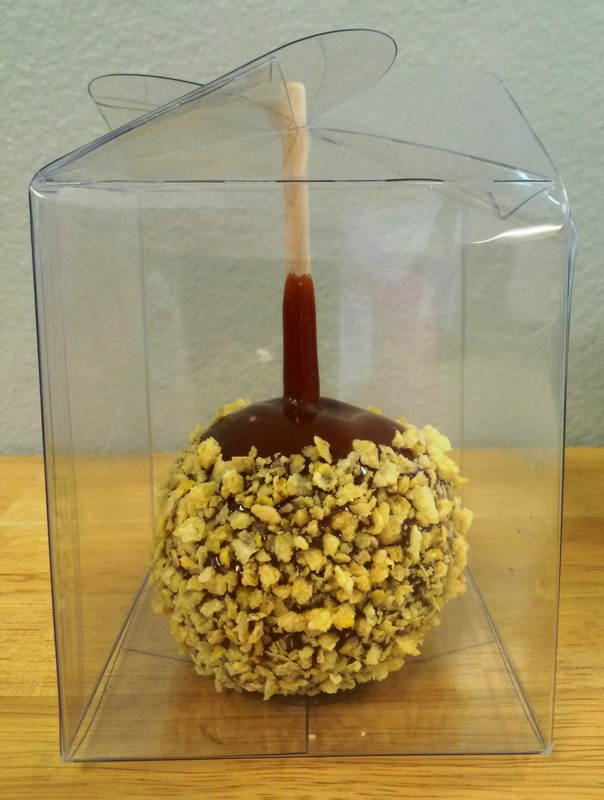 They even come pre-punched with an ‘X’ in the top, for the caramel apple stick. 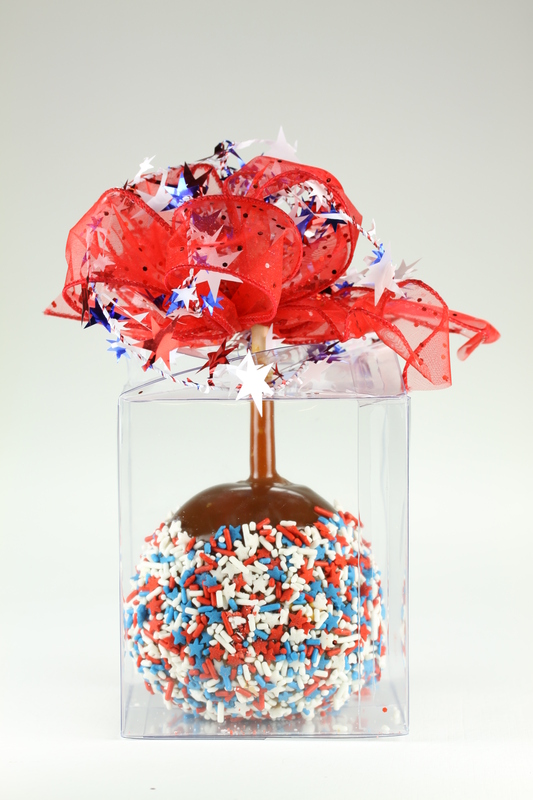 …but they also work really well with larger, gourmet apples!! Posted in Caramel Apple Wedding Favors, Daffy Farms, Decorating Ideas, Delicious Pictures, DIY, The Daffy Apple and tagged apple, box, caramel, caramel apple, caramel apple box, caramel apples, carnival, daffy apple, daffy farms, event, fall, gift, gift box, iddba, packaging, petite, rainbow, red candy caramel, sprinkles, trade show, traditional, white on July 20, 2015 by daffyfarmsblog. 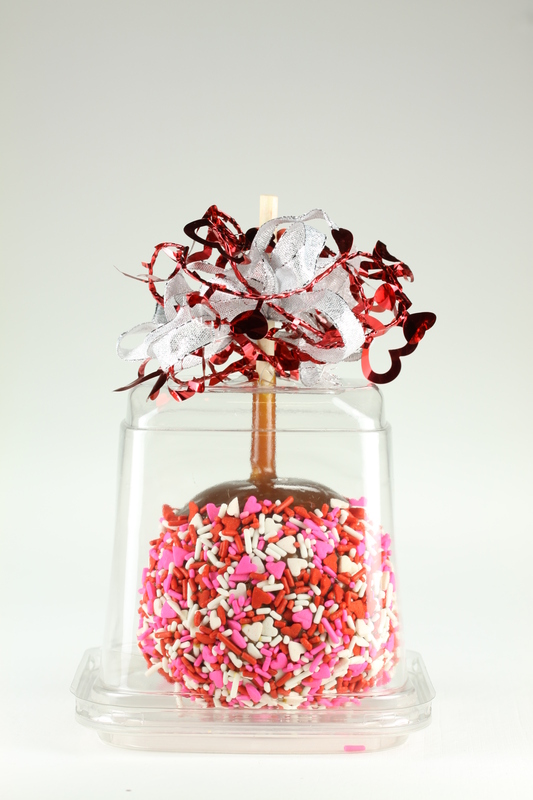 Valentine’s Day is four days away…do you have a treat for your Valentine yet?! 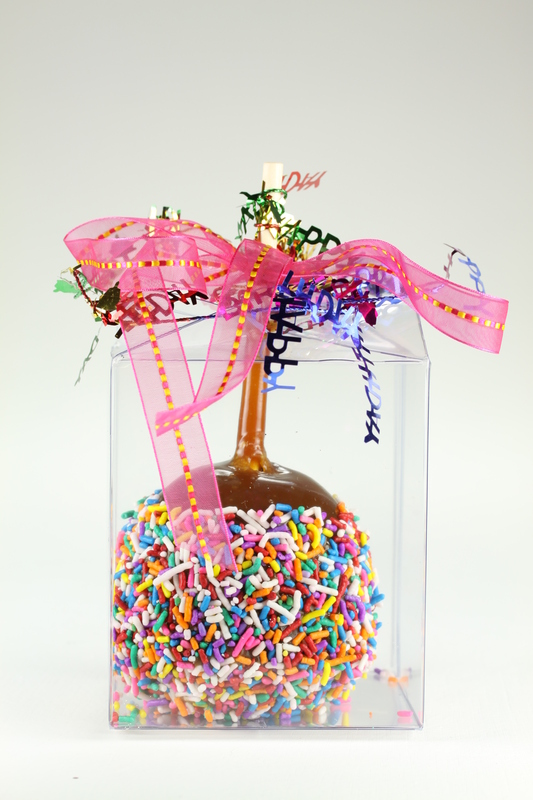 Posted in Bulk Caramel, Daffy Farms, Decorating Ideas, Delicious Pictures, The Daffy Apple and tagged bulk caramel, caramel, caramel apple, caramel apples, daffy apple, daffy farms, dipping caramel, event, hearts, pink, red, red candy caramel, sprinkles, valentine, Valentine's Day, white on February 10, 2015 by daffyfarmsblog. Thank you to Denise for sending us these adorable photos! 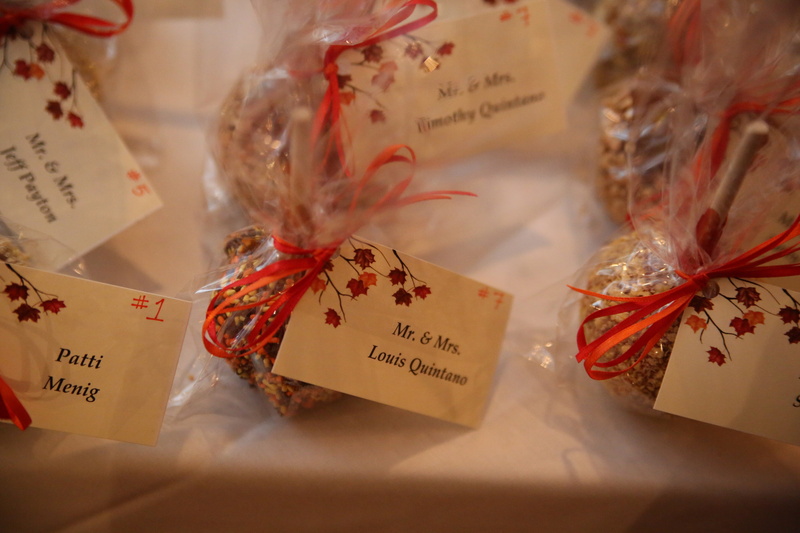 She used our Petite Caramel Apples as place cards for her wedding last fall!! 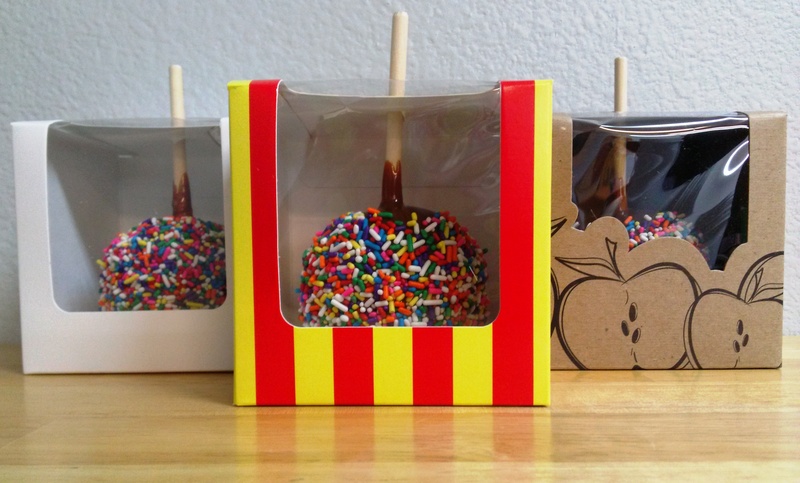 Posted in Caramel Apple Wedding Favors, Daffy Farms, Decorating Ideas, DIY, The Daffy Apple and tagged caramel apple, caramel apples, daffy apple, daffy farms, diy, event, fall, party, red, shower, sprinkles, wedding, yellow on September 29, 2014 by daffyfarmsblog. 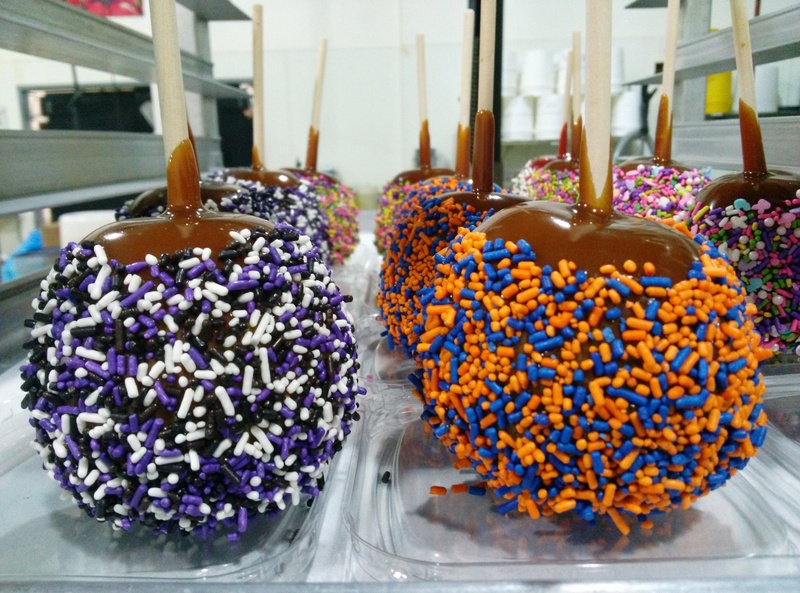 Q&A Tuesday: When are Daffy Apple Petite Caramel Apples in season? 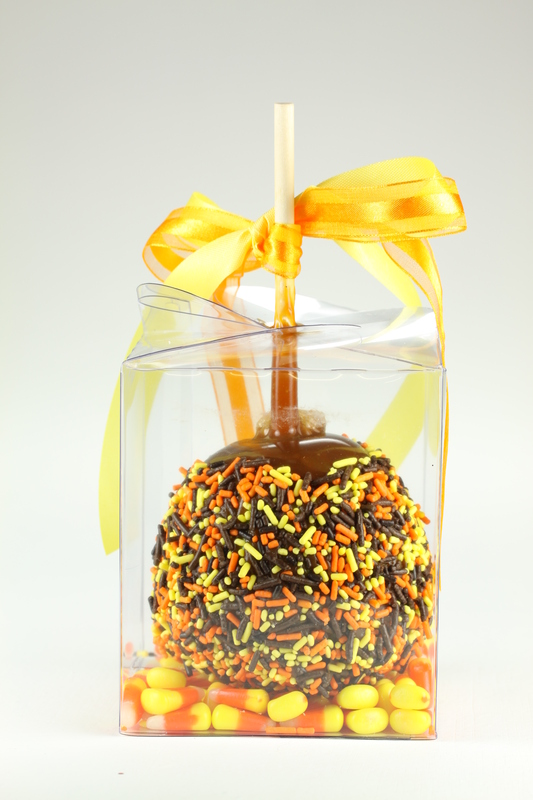 Daffy Apple Petite Caramel Apples are produced from late August until early December. 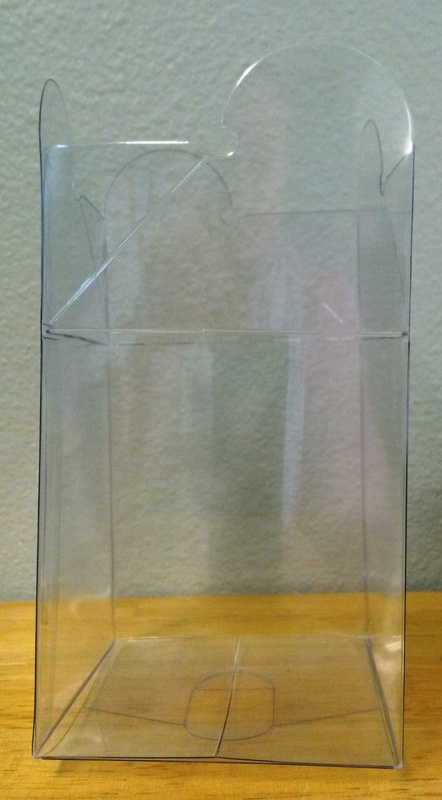 Local customers in the Denver Metro Area may contact us to discuss order pick-up starting in August. 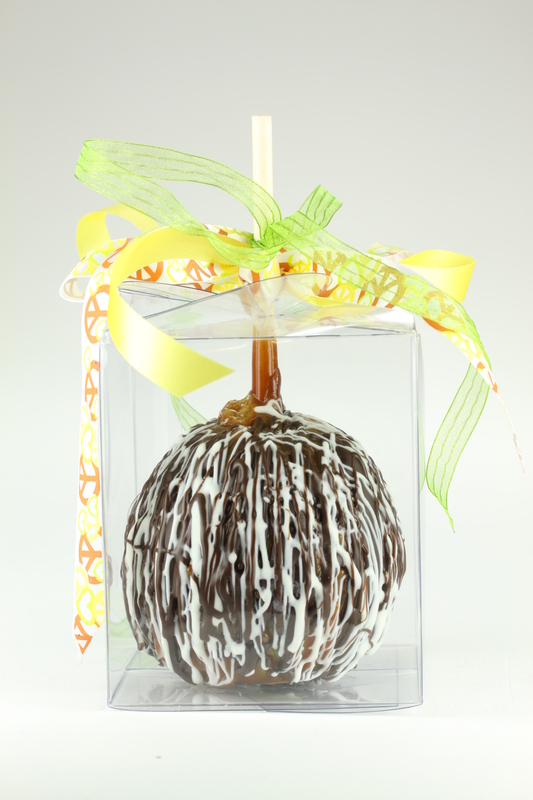 We will not ship Daffy Apple Petite Caramel Apples until late September due to temperatures and the perishable nature of caramel apples. 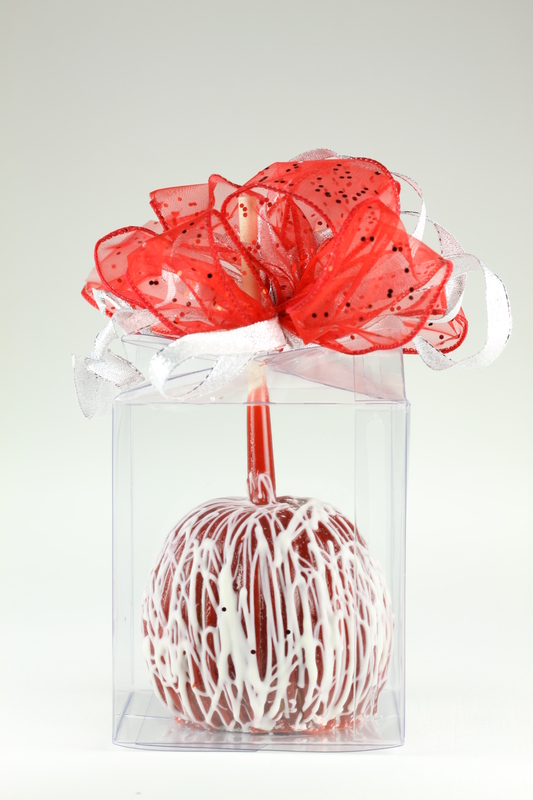 Please review the Petite Caramel Apple Ordering Deadlines & Information page for further information about shipping dates and timelines. 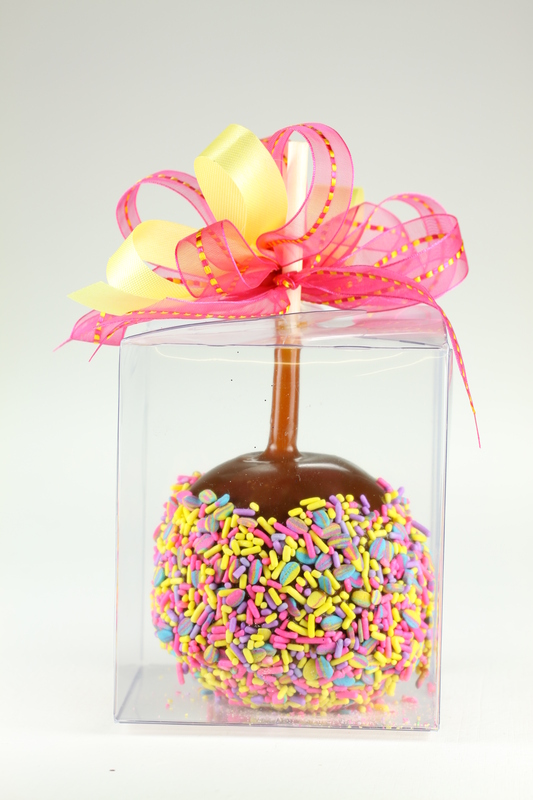 We also produce a limited number of Daffy Apple Petite Caramel Apples in April each year, which is the perfect time to try a Petite Caramel Apple Sample Pack before ordering a larger quantity for a fall event! 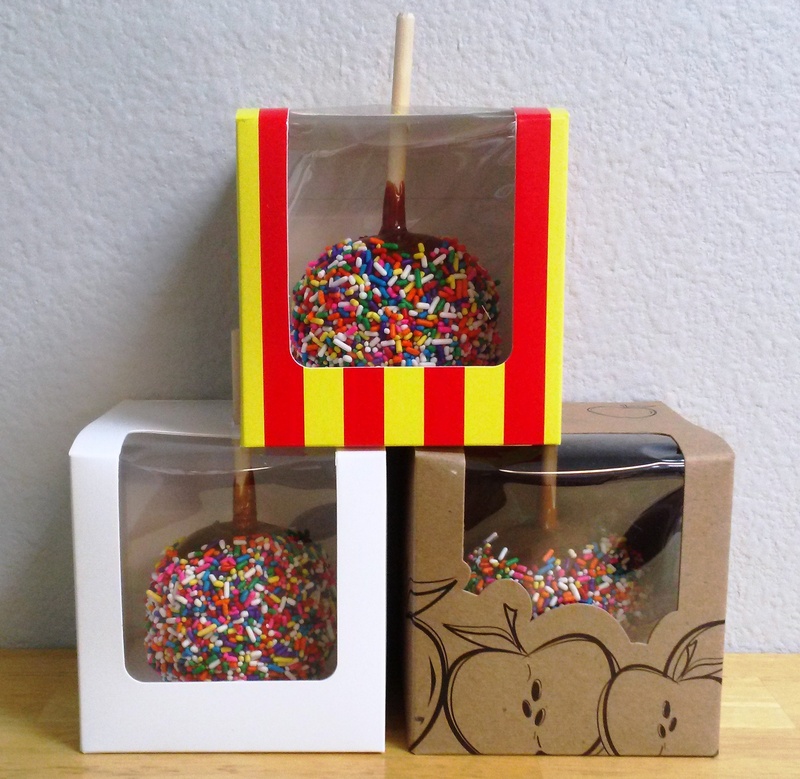 Posted in Caramel Apple Wedding Favors, Daffy Farms, Q&A Tuesday, The Daffy Apple and tagged birthday, caramel, caramel apple, caramel apples, carnival, daffy apple, daffy farms, denver, diy, event, fall, party, petite, Q&A Tuesday, rainbow, season, seasonal, sprinkles, traditional, wedding on July 29, 2014 by daffyfarmsblog. 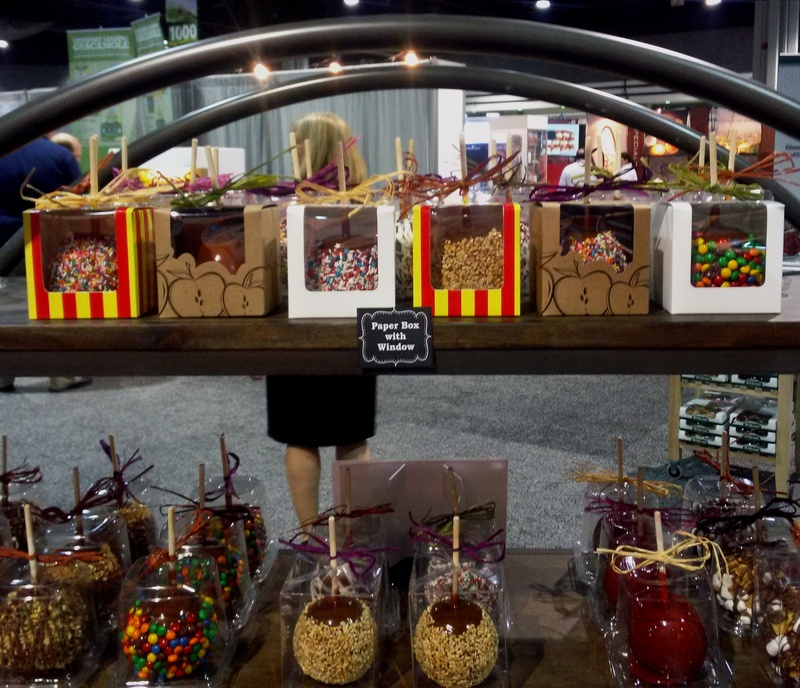 While preparing for the IDDBA Dairy-Deli-Bake Seminar & Expo 2014, we made over 170 gourmet caramel apples in order to showcase our Daffy Apple Traditional Dipping Caramel. It was a fun experiment in which we learned which toppings work with both the flavor and the holding power of our caramel. 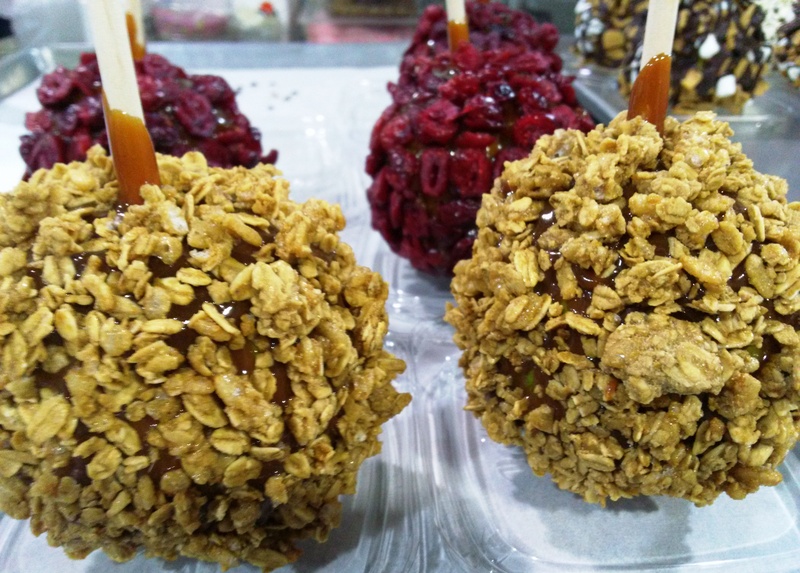 Cranberries are a topping we have used in the past and currently use on our Daffy Apple Premium Caramel Apples with Cranberries and White Chocolate with Milk Chocolate Drizzle. Granola, though, is an entirely new idea based on an suggestion from a customer. We used a very basic granola, but there are so many different mixtures that would taste excellent with apples and caramel. 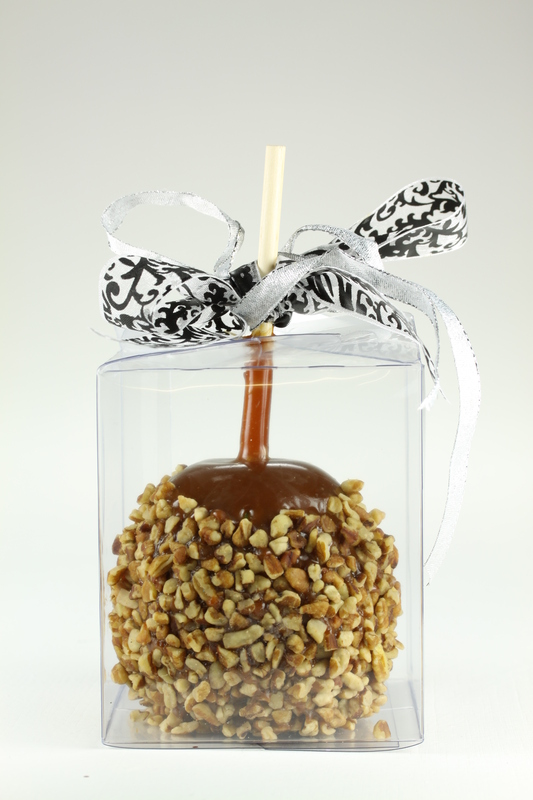 We also added a white chocolate drizzle to a few of the granola caramel apples to take the taste one level further. Sprinkles are a classic topping choice. We have several color combinations available for order on our website, however for the show we did a few sports themed combos. We are located in Denver, Colorado – bet you can’t guess which teams we chose! There are a number of sprinkle-like toppings out there, too. 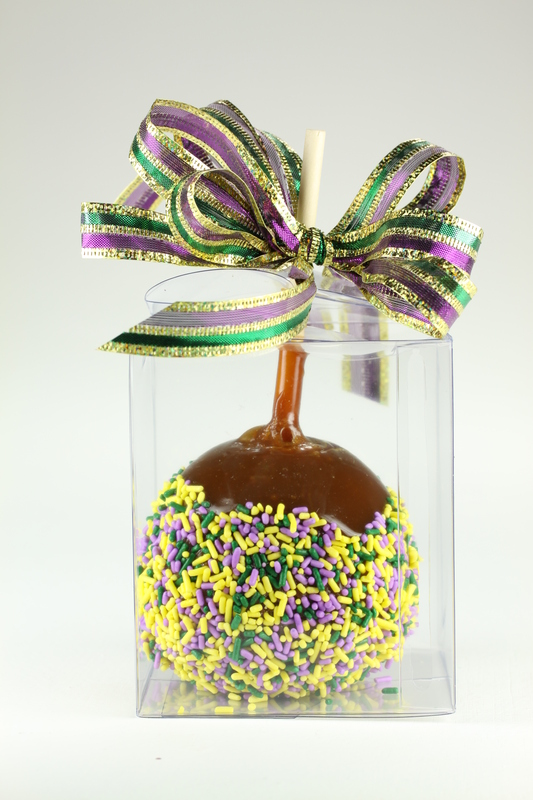 We only scratched the surface by including shaped decorettes and nonpareil pearls on this spring holiday themed caramel apple. Go to the cake decorating section of any craft store and you will find a whole new world of edible sugars, crystals, and even glitter! 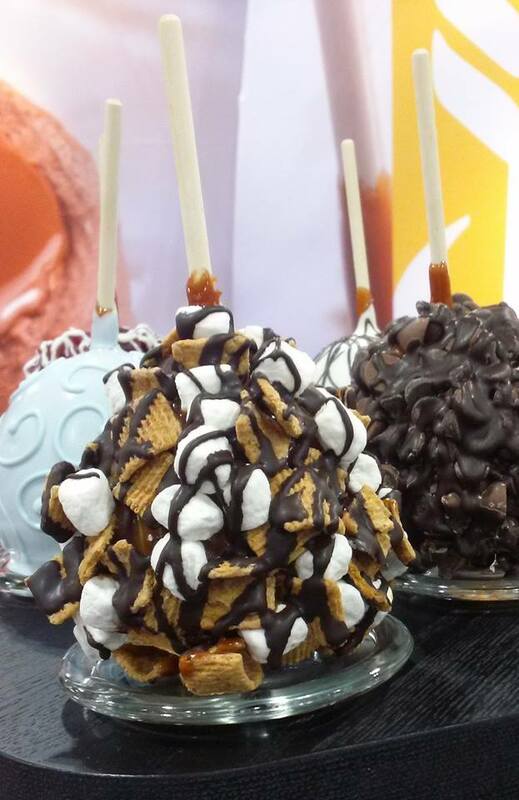 The theme of the expo was camping and so we took our favorite campfire tradition, S’mores, and turned it into a caramel apple by using graham cracker cereal, mini marshmallows and a a milk chocolate drizzle. Most desserts, from pies to candies to pastries to frozen treats, could be translated into pieces and rolled onto a caramel apple. Posted in Bulk Caramel, Daffy Farms, Decorating Ideas, Delicious Pictures, DIY, The Daffy Apple and tagged bulk caramel, caramel apple, caramel apples, colorado, cranberries, culinary, daffy apple, daffy farms, decorettes, dipping caramel, diy, event, gourmet, granola, iddba, nonpareils, s'mores, sprinkles, trade show, traditional on June 12, 2014 by daffyfarmsblog. 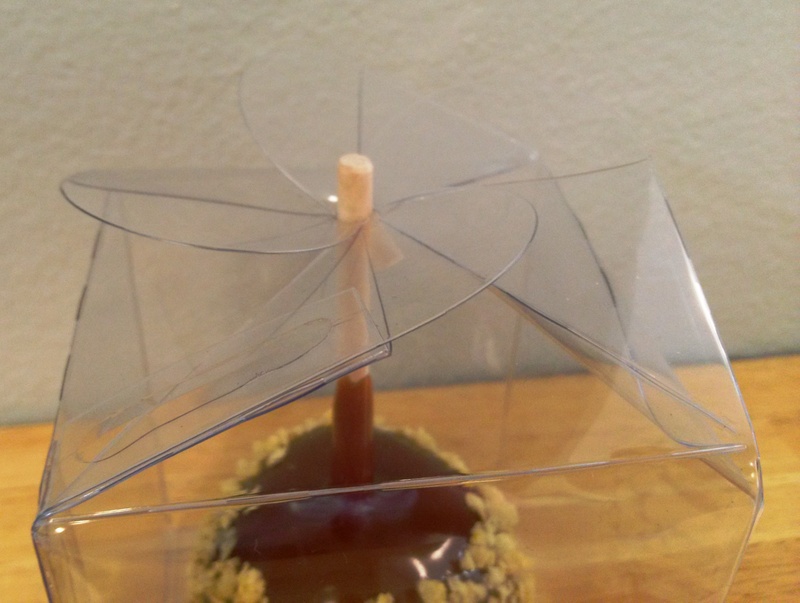 Q&A Tuesday: Do you make Daffy Apple Petite Caramels Apples without nuts? Absolutely! We offer crunch, which does not include nuts, and sprinkle toppings. All of our topping options can be viewed here. 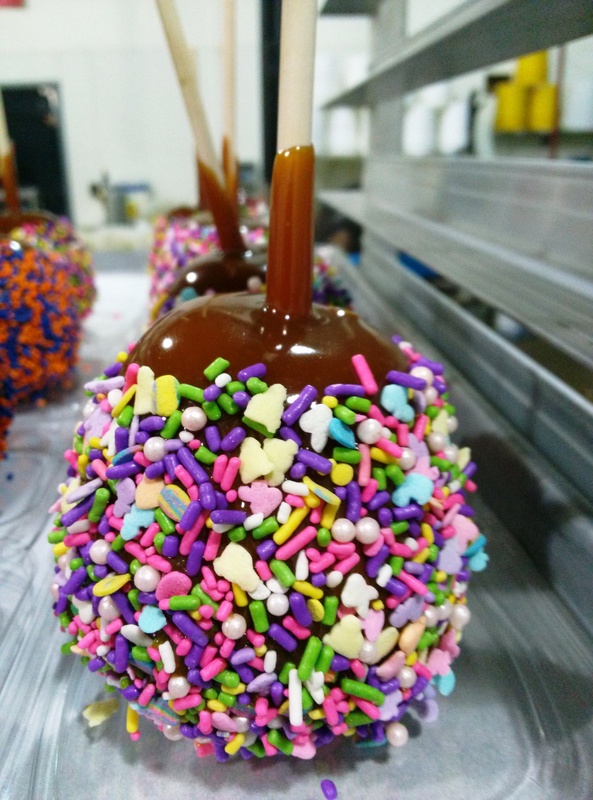 Though we follow strict allergen guidelines when processing Petite Caramel Apples, please be aware that all Daffy Farms and Daffy Apple products are produced in a facility that also handles peanuts and tree nuts. 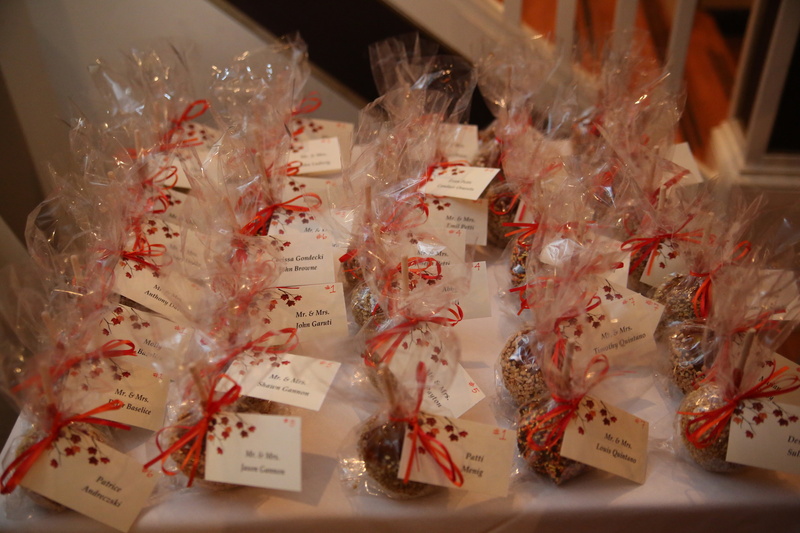 Posted in Caramel Apple Wedding Favors, Daffy Farms, Q&A Tuesday, The Daffy Apple and tagged allergens, caramel apple, caramel apples, carnival, crunch, crunch topping, daffy apple, daffy farms, dipping caramel, event, petite, Q&A Tuesday, sprinkles, traditional on May 21, 2014 by daffyfarmsblog. 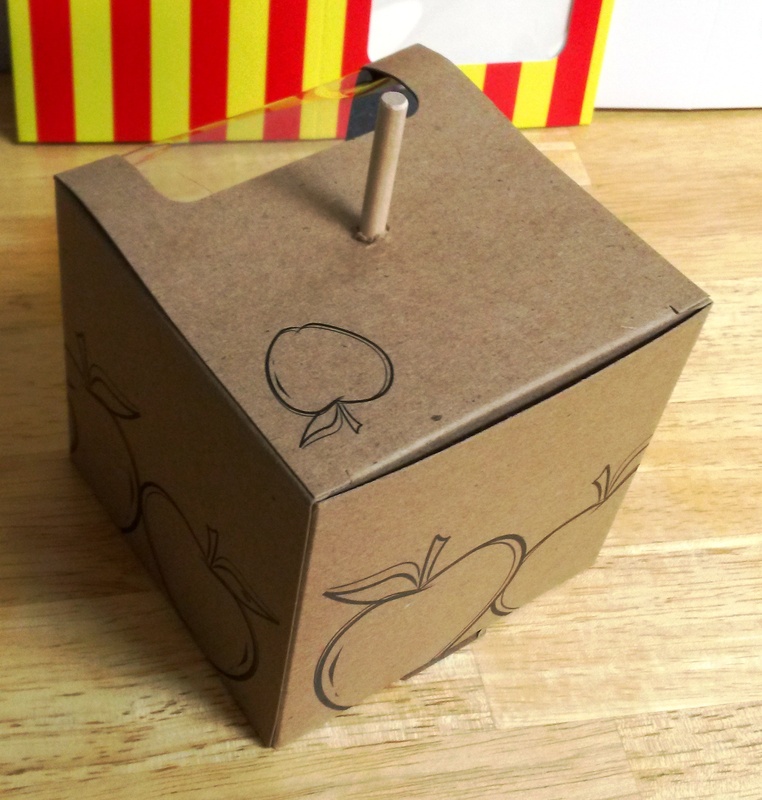 The Clear Caramel Apple Box. It is a decorator’s dream. Posted in Caramel Apple Wedding Favors, Daffy Farms, Decorating Ideas, Delicious Pictures, DIY, The Daffy Apple and tagged 4th of july, apple, birthday, black and white, box, caramel, caramel apple, caramel apples, carnival, clear, clear caramel apple box, daffy apple, daffy farms, decorating, dipping caramel, diy, easter, event, fall, formal, gourmet, green, halloween, holiday, ideas, mardi gras, package, packaging, party, pecans, pink, rainbow, spring, sprinkles, traditional, Valentine's Day, wedding, white chocolate, yellow on May 15, 2014 by daffyfarmsblog.